Solar for All in D.C. The D.C. Solar for All program provides grant payments for solar installation to eligible low- and moderate-income D.C. residents. We are committed to making solar affordable and accessible to all. We’ve worked for years in the District to make this a reality. We are now helping to implement an ambitious plan to use solar to reduce the bill of every low-income resident of the District by 50 percent. Solar United Neighbors was selected to help implement the program by providing free solar to more than 200 low- and moderate-income D.C. residents living in single-family homes through solar co-ops. Households that earn less than 80 percent of area median income are eligible to get their system paid for under Solar for All. History of our work on solar for all in Washington, D.C.
We are committed to solar that is affordable and accessible to all. We partner with low-income housing providers, provide technical assistance to solar developers, and are working with the city and other partners to develop a meaningful low-income solar program for DC. 2012 - The District’s Department of Energy & Environment (DDOE) and the DC Sustainable Energy Utility implemented a low-income solar incentive program that put solar on 87 low-income homes in the District. Read about the results of the program. Summer 2011 to October 2013 - We worked with D.C.'s community of solar supporters and low-income housing, environment, and community groups to pass legislation to make community solar possible. 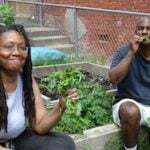 2013 - We piloted a bulk purchase program for D.C. organizations interested in going solar. Local nonprofits, community organizations, churches, and small businesses were eligible to participate, with the goal of providing organizations with the opportunity to go solar and cut their electricity bills. Three organizations participated in the program and went solar via a Power Purchase Agreement. 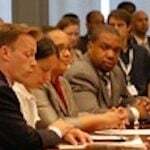 October 2013 - The D.C. Council passed the Community Renewable Energy Amendment Act of 2013. This law allowed renters, homeowners with shaded roofs, tenants of apartment buildings, and others to participate in the District’s solar revolution. Learn more about the history of Community Solar in D.C.
April 9, 2014 - We worked with the George Washington University Solar Institute to convene a daylong event to discuss and develop recommendations on how to accelerate the deployment of solar to benefit low-income District residents. 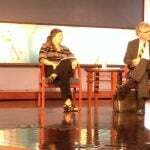 Roughly 70 key stakeholders from low-income housing, the solar industry, financial institutions, the federal and D.C. governments participated. 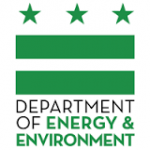 January 2015 - The District’s Department of Energy & Environment (DDOE) and the DC Sustainable Energy Utility (DC SEU) jointly announce a new incentive program for low-income homeowners to receive free solar installations. The Solar Advantage Plus Program (SAPP) was allocated $1.4 million, with the goal of completing 130-140 installations by September 2015. May 13, 2015 - We held a meeting to educate the community about the new Solar Advantage Plus Program and help families apply for funds through the DC SEU. See the meeting handout with additional resources on the District’s low-income incentive program. The Washington Post covered the meeting. 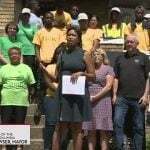 July 25, 2016 - The D.C. mayor signed the Solar for All program into law. The bill requires DOEE develop a program to use solar to reduce the energy bills of 100,000 low-income D.C. residents by 50 percent by 2032. Solar United Neighbors worked diligently for months to ensure that a robust low-income solar program with a dedicated funding source was included in the legislation. 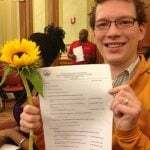 October 2013 - January 2017 - We pushed the D.C. Public Service Commission and city agencies to implement the community solar law and develop a Community Solar program that works for all D.C. residents. July 21, 2017 - DOEE announced 10 Solar for All awards, officially launching program implementation. The Solar for All page on the District’s Department of Energy & Environment (DOEE) site provides an overview of the program and includes links to the implementation plan and other documents. Solar Works DC was started by DOEE in 2017 to increase access to clean energy and create a long-term pipeline for green jobs. The program provides job training for D.C. residents interested in careers in solar energy. Press Release announcing $13.2 million in Solar for All grants awarded to 10 organizations to implement Solar for All, including us (under our old name, Community Power Network). Solar United Neighbors put on a Low-Income Solar Roundtable with the GW Solar Institute in 2014. The stakeholder group produced a helpful backgrounder and white paper detailing the challenges and opportunities for low-income solar.